The camshaft position (cmp) sensor consists of a magnet and an iron core which is wrapped with copper wire, and is installed onto the cylinder head. When the camshaft rotates, each of 3 teeth on the camshaft passes through the cmp sensor. This activates the internal magnet in the sensor, generating a voltage in the copper wire. The camshaft rotation is synchronized with the crankshaft rotation. When the crankshaft turns twice, the voltage is generated 3 times in the cmp sensor. The generated voltage in the sensor acts as a signal, allowing the ecm to locate the camshaft position. This signal is then used to control ignition timing, fuel injection timing, and the vvt system. Dtc p0340 indicates a malfunction relating to the cmp sensor (+) circuit (the wire harness between the ecm and cmp sensor, and the cmp sensor itself). The correct waveform is as shown in the illustration. 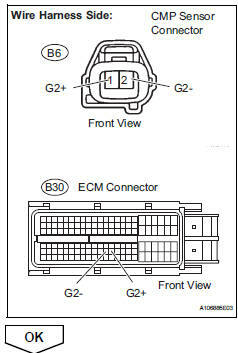 G2+ stands for the cmp sensor signal, and ne+ stands for the crankshaft position (ckp) sensor signal. 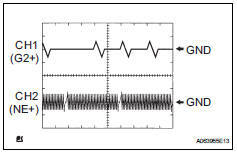 Grounding failure of the shielded wire may cause noise in waveforms. If no signal is transmitted by the cmp sensor despite the engine revolving, or the rotation of the camshaft and the crankshaft is not synchronized, the ecm interprets this as a malfunction of the sensor. Refer to dtc p0335 (see page es-174). Disconnect the b6 camshaft position (cmp) sensor connector. Measure the resistance between terminals 1 and 2. Terms cold and hot refer to the temperature of the sensor. Cold means approximately -10° to 50°c (14 °to 122°f). Hot means approximately 50° to 100°c (122°to 212°f). Reconnect the cmp sensor connector. Disconnect the b6 cmp sensor connector. 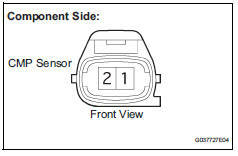 Check the cmp sensor installation. Ok: sensor is installed correctly. Check the teeth of the camshaft. 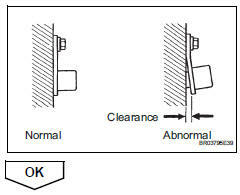 Ok: camshaft teeth do not have any cracks or deformation. Select the following menu items: diagnosis / enhanced obd ii / dtc info / pending codes. If the engine does not start, replace the ecm.